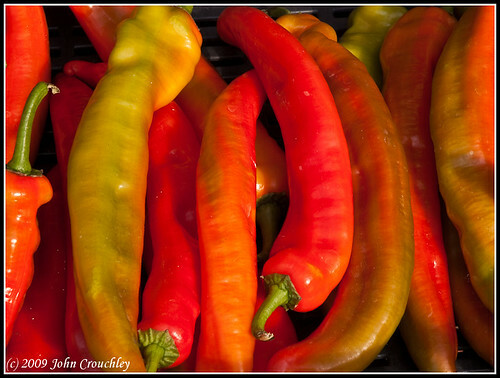 Peppers, peppers and more peppers. 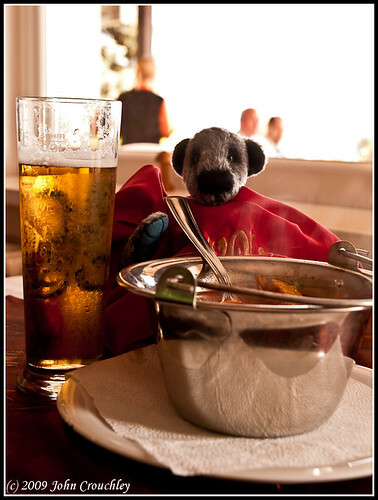 We thought we’d have a mooching about day today. Breakfast was great, we were the only people staying at the hotel last night and they did us proud. 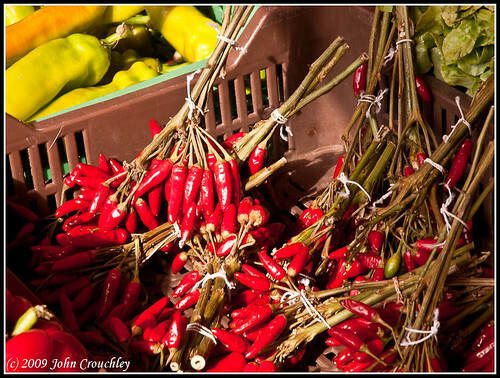 Maria wanted some peppers to take back (apparently the ones in England just aren’t the same) so we headed off to Szekszárd, which has a market. It was one those typical Hungarian markets, stalls are provided and then all sorts of people bring in whatever they have to sell. Some are real traders, others little old ladies with a handfull of produce left over from what they grow in their garden. I think some of these might be a bit hot. We then headed for Decs, on the trail of some more folk art, but found the place only opens on Tuesdays and Fridays or by appointment. a bit of a disapointment. We diverted to Paks instead. 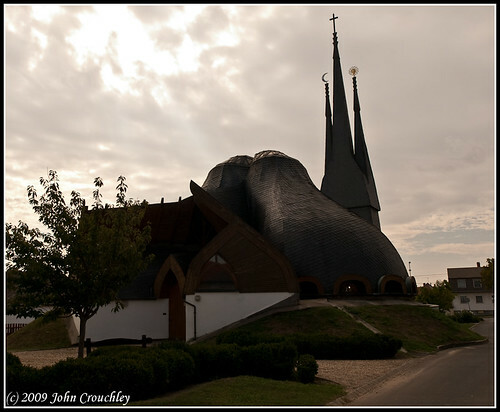 They have an unusual church (if the pictures are anything to go by) and are supposed to do excellent halászlé. 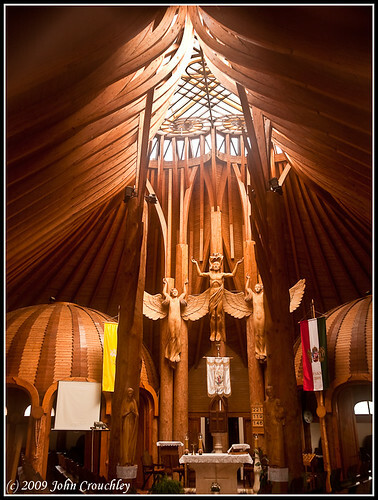 The pictures of the church don’t do it justice. It was stunning, very organic in shape. It was closed, but what we could see from the door looked beautiful. We then headed off for the halászlé, since it was special I decided to have a try. I’m not sure I would have if I’d known they would give me a bib(!!) to wear. Still it did taste good. Maria hates fish bones so she chickened out and had some pork instead. It was covered in garlic and we had to share the car with her for the rest of the day! 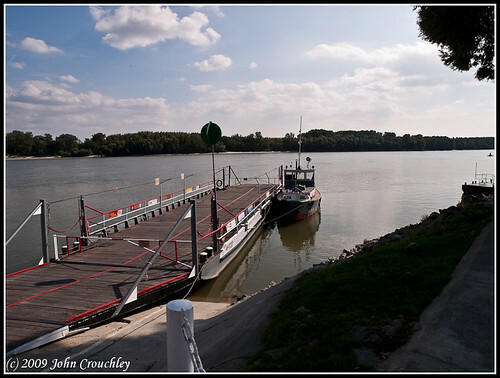 We needed to cross the Danube so instead of driving for miles we took the Komp, a sort of dinky ferry. 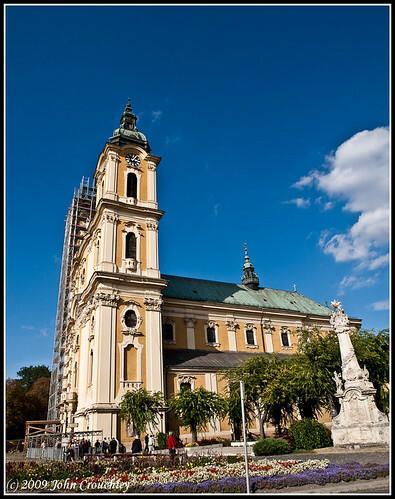 …and headed for Kalocsa, another of the towns famous for it’s embroidery. Luckily as it is nearing the end of the season their stocks were much depleted and we got away without buying any. We did buy some china, but it was pretty. We were then ready for a quiet sit down and a cake in the square in the centre of Kalocsa. I do like Hungarian cakes, it was just a shame I couldn’t manage an ice cream as well. 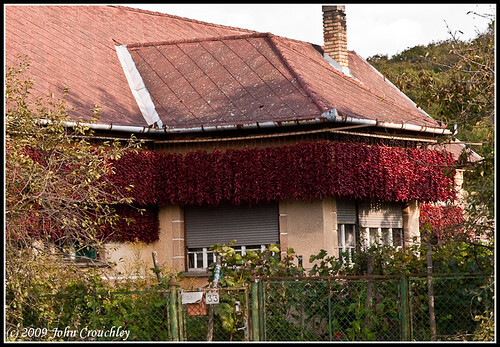 On the way we saw some fields of peppers, Kalocsa is one of the prime paprika areas, and some houses with red peppers drying before being ground into paprika. It looks most attractive. 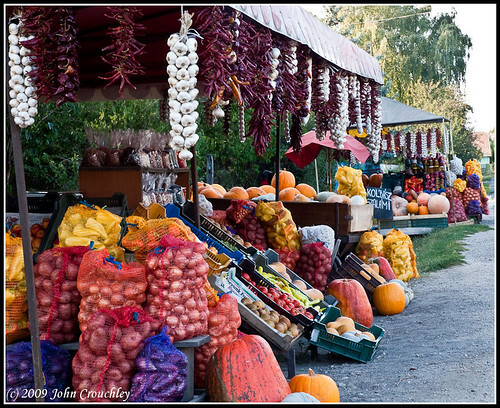 There are also roadside stalls selling veg. and Maria saw some with peppers. So of course we had to stop. She bought not just a few but a whole sack!!!! 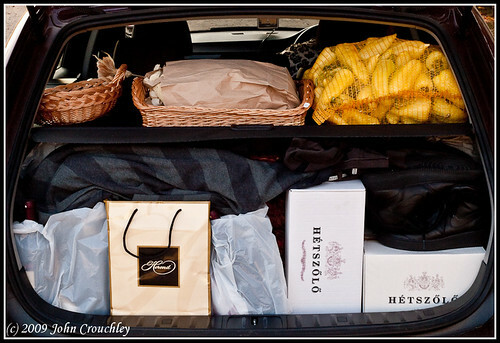 The boot of the car is stuffed! They are talking of going to Tescos tomorrow and shopping! I am NOT going back to England on the roofrack. This entry was posted on Wednesday, September 30th, 2009 at 5:36 pm and is filed under Hungary. You can follow any responses to this entry through the RSS 2.0 feed. You can skip to the end and leave a response. Pinging is currently not allowed.